A super easy weeknight Thai Green Curry Paleo Recipe with Chicken that the whole family will love! Heat the oil in a large pan, I used an enameled cast iron Dutch Oven. Then, add garlic and curry paste to the hot oil and stir for just a minute. Add the coconut milk and halved potatoes then simmer for ten minutes. next add the fish sauce, coconut sugar and chicken and cook for ten more minutes or until chicken is cooked. Add in the green beans and cook for five more minutes. Taste and season further with fish sauce if you need to before serving. I really like the Red Boat brand of fish sauce, it’s the best tasting one I’ve used so far and it’s Paleo and Whole30 compliant. I also prefer to use full fat Coconut milk for this recipe, my favorite brand is Native Forest. Is Thai Green Curry Gluten Free? 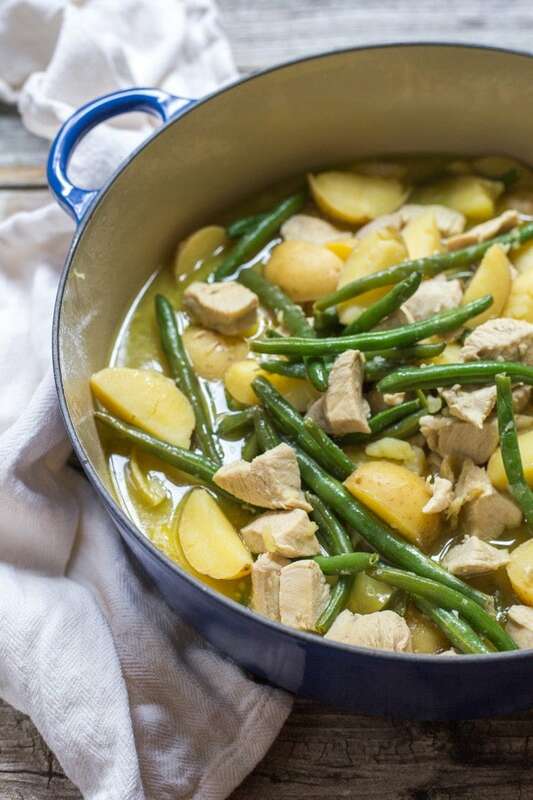 Typically Thai Green Curry is gluten free, and this recipe certainly is! 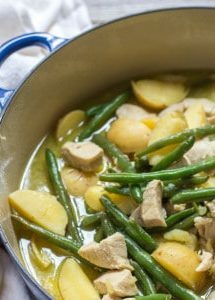 There are not usually any gluten containing ingredients in most recipes which usually consist of coconut milk, green curry paste, fish sauce and a variety of vegetables and meat depending on how you make it. It goes without saying that if you are not making it yourself and you see it on a restaurant menu don’t simply assume it’s gluten free, always ask to make sure. A super easy weeknight thai green curry paleo recipe, with Chicken, that the whole family will love! Heat the oil in a large wide based pan, add garlic and curry paste to the hot oil and stir for a minute. Add in the coconut milk and halved potatoes, simmer for ten minutes. Add the fish sauce, sugar and chicken, cook for ten more minutes or until chicken is cooked. I must say this looks like a great comfort food! I haven’t had chicken curry in a looong time but I will have to try your recipe, it looks so delicious! Sounds like you have traveled all over the world. I bet Thai food in Australia is outstanding. I absolutely love making and eating curry. I recently had a green curry at at Thai restaurant this past weekend and had another craving for it. This recipe looks so simple so I’ll have to try it out. This looks divine! I’ve never made a curry before but this looks delicious and i need to try it! I love that you use coconut oil in this recipe.. I often substitute that where ever I can so its nice to see a recipe already using it 🙂 I have never had curry before but this recipe is easy and look amazing.. I cant wait to try it!! This looks good. I love Thai food and green curry is always a favourite. When we were in Thailand we did a cooking class and one of the dishes was a green curry. The class included a trip to the market. I was amazed when the teacher took us to the stall where she buys her green curry paste! She said it was much easier and probably better! Just found your blog from Food Bloggers Central’s Facebook group. Fun to find another Sheena food blogger (I’m Sheena from http://www.gatheringtable.net). This recipe looks delicious.